"On eye level" sold at WADM 5th time! Dec 2017 - Second time “On eye level” sold at Werk aan de Muur in Belgium, 95*65 canvas!! Dec 2017 - “On eye level” sold at Werk aan de Muur, 110*75 canvas!! Don't try this at home! 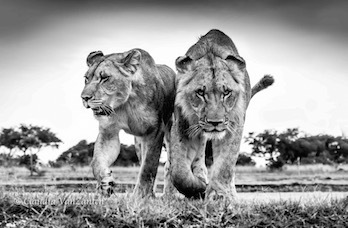 Two young lions photographed from a prey’s point of view. These two lions are part of stage 1 of the rehabilitation program of ALERT rehabilitation program. This photo was taken at Antelope Park Zimbabwe.